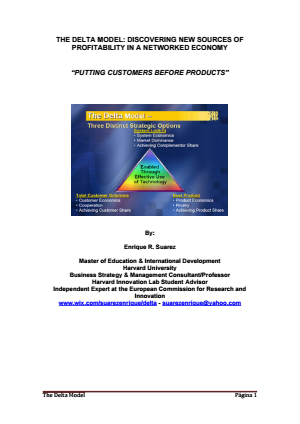 Delta Model Primer - The Delta Model is a revolutionary Growth Strategy framework for small to mid-size businesses. The Delta Model is a revolutionary Growth Strategy framework for small to mid-size businesses. Download the Delta Model Primer by submitting the blue form below. This 8-page paper (in MS Word) presents an overview of a powerful, new framework called the Delta Model. The Delta Model was developed by Dean Wilde and Arnoldo Hax of the MIT/Sloan School of Management to help managers in the articulation and implementation of effective corporate and business strategies. This framework grew from our conviction that the world of business had been experiencing transformations of such magnitude that existing managerial frameworks were now either invalid or incomplete. The Delta Model has spawned a long list of research efforts as academics around the world have looked to extend the concept through application to a number of new and old economy industries. The Delta Model has attracted the interest of corporate executives as well, and has been featured in a number of articles and conferences. Note the author of this document will receive your information entered to the right. Download the Delta Model Primer now!